Third time’s a charm, and utterly charming! I made the 6 mo. size but my gauge was tight, so the hat is 14″ in circumference, which is more of a newborn size. Other than that, I made no changes. What an excellent use of sock yarn leftovers this is! If you didn’t have a hundred yards left of one yarn , you could stripe two different colors. Next weekend’s MA Sheep and Wool, and my favorite Fantom Farm guys will be there, seducing me with their wools. In preparation, I’ve started spinning up the remaining rovings purchased from them at Rhinebeck. The yarns spun from them will be knit into my sweater for Rhinebeck this year, which is going to be some yoke number with the giant brown Rambouillet fleece spun up for the body and sleeves. These two colors are going into the sweater so far. I have one more brown-y green one and hope I can find at least one more brown-y green next weekend. I’m hoping to be able to get the colors to merge slowly from the natural brown fleece to chartreuse (shown in the linked 2 colors photo) at the collar. My new glasses are orange and chartreuse. I’ll be all matchy! Wow, this is great. It would be perfect for my son, who is now bald. (An accidental misjudge during a routine hair trim. )I love the colors! Â¡Hello! 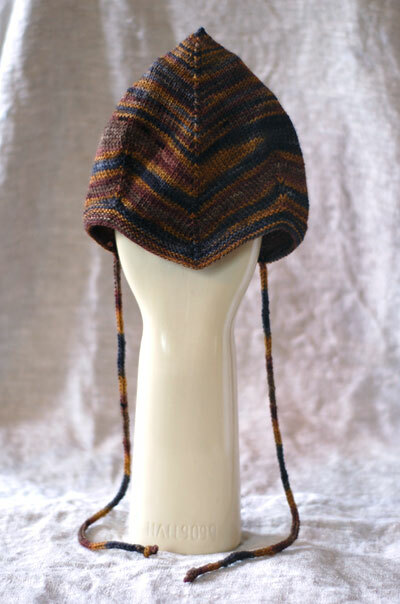 The norwegian baby hat is a beauty and that yarn too. :) I would like to request your permission to translate your pattern Top Down Bonnet with Anime Character into Spanish so that my family and friends could use it too. I would also like to publish the translation in my blog if you donÂ´t mind. Thanks. This is so adorable! And I just love to see what you’re spinning lately. That hat is too cute to resist. Thankfully, a friend is having a baby soon! This turned out so great! Adorable! but I can’t believe you put it on that creepy hand! That hand gives me the heebie-jeebies. I can’t wait to see that sweater!!!!!! That hat is so cute. Thanks for getting the wheels moving to have it translated. I am planning to cast one on soon. My sister gave me all her old sock yarn with the idea that I would remember where I bought it and get her another skein of each. In reality, I just buy her another skein or two for her birthday and Christmas each year. I am going to use up that bag to make a few hats for charity and/or baby gifts. 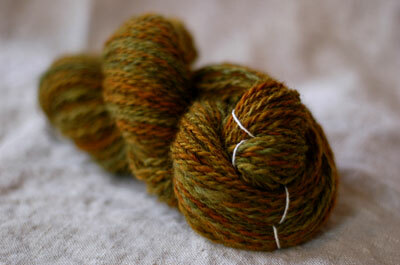 Fantom Farms have some gorgeous fiber, they are always one of my stops at the MA festival. I had my doubts, but the finished baby hat is wonderful! I think the yarn really makes it. You have a wonderful eye. ha! the hat is super cute. i have 3 little preemies to knit them for. by the time, they’re knitted up, the babies will hopefully be big enough. It look great! I like this hat! Adorable color! Well Adrian, your blog never fails me. High-quality, low-fat knitting content, chock full of fiber with occasional nuggets of free pattern-y goodness. So good for my health! I love the hat. I can’t wait to knit it. The Rhinebeck sweater looks like a huge job, but I am sure it will be wonderful. I have to say, I gasped when I saw that huge fleece spread out on the lawn. Post lots of pics! omg, that baby hat is too adorable! It’s so cute it makes me want to have another baby…….almost. Gorgeous it is. But on to your Rambouillet fleece. I purchased a smaller one an MDSW and can’t seem to get the grease out-how do you de-grease yours? Can’t wait to see the sweater. I have some thing roiling around in my head for some of the crazy fleeces I’ve bought this year. Cholocalatey black rambouillet, very fine grey-brown romney-corriedale, a lovely bowncy Jacob, and a white romney, which I didn’t have enough sense to dye pre-carding. So much cuter than socks! I LOVE it! love the shape, love the colors, I want one in an adult size. I love the hat! More baby knits, yay! Your spinning is so great. I need to learn! Hi – this is a *darling* pattern. I have knit 2 for a new baby. Do you possibly have a matching sweater pattern?